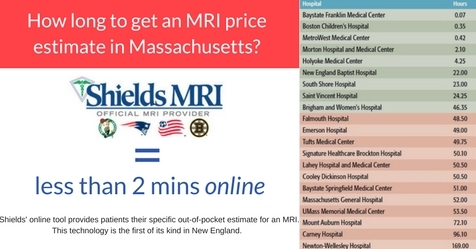 Shields MRI: first in NE to provide out-of-pocket patient estimates – online. Shields, the largest network of imaging centers in New England, will provide patients with personalized estimates of the out-of-pocket costs they could pay for an MRI, the organization said in an announcement emailed to FierceHealthcare. The tool factors the overall costs of care as well as a patient’s individual health plan to come up with an estimate. It is one of the first such tools available to patients in the region, according to the announcement. “By putting this new tool online not only are we helping our patients have better information in advance so that they can plan for their healthcare needs, we believe we will lead the way in the healthcare industry in New England toward transparency in the pricing process,” Shields CEO Tom Shields said in the announcement. Price transparency for MRIs can lead to lower patient costs and more competition to attract those patients, research suggested. Although patients have more access to a number of price transparency tools, they often are lukewarm toward the technology. Provider outreach can better inform patients of what these tools do and how they can take advantage of them. A recent study from Harvard found a number of barriers to patient use of such tools, including that they simply forgot or did not find them useful. Patients in rural areas didn’t feel they had enough choice between doctors to use them, and some patients said they were too loyal to their doctors to shop around. A separate study found that the number of patients who say they support and would use price transparency tools is far greater than the number who actually take advantage of tools to comparision shop. The survey found 13% of respondents looked up price information, but just 3% factored it into decisions about care. Massachusetts specifically mandates that providers make pricing information available, though hospitals in the state still often fall short of the requirements.